On my return from California to India, I flew via Hong Kong. The flight timings left me with about nine hours in Hong Kong, and little idea of what to do. I learned that I could take the airport express into the city, and if I returned on the same day, I only had to pay one way. I quickly grabbed some breakfast and a map of the city, and jumped onto a train. While on the train, I figured out the scale of the map, and realised that Hong Kong is really small - that's if you look at it area wise. Turn your head upwards, and small wouldn't quite fit. I got into town, and found my way out of the station. The road is two or three levels up. It was still fairly early in the morning, around 6:30am or so, and there were low clouds all along. A light drizzle kept starting and stopping. I walked down the road for a while trying to figure out where on the map I was. The cool thing about the map that I had, was that all major buildings were listed, so it was easy to figure out where I was once I saw the Hong Kong and Shanghai Bank and Bank of China. It was then easy to decide where I wanted to go and plan out my route for the next few hours. Hong Kong is walkable for the most part. All department stores and office buildings are near each other, as is the Hong Kong park and Banks. It's also possible to get around without actually walking out into the open because all buildings are connected to each other. Hong Kong has good public transport. Bus services are run by various companies, but it's seldom necessary to take one. 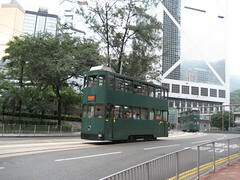 A popular form of transport is the city tram. These trams run along fixed rails across the city, and it's crazy how close each tram runs to the one in front. 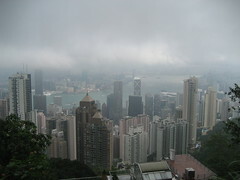 I decided to start my day with a visit to The Peak and get a view of the whole of Hong Kong city. There are multiple ways to get up to the peak. 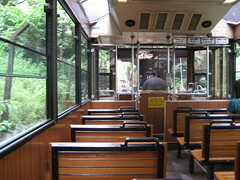 There's the hiker's trail, a road for driving, and buses, but the most fun ride has to be the peak tram. The first thing you notice when you get into the tram is that the floor is made up of a series of concave sections. They look like steps, but they're all along the same horizontal level. Once the tram starts, you realise what they're for. The tram starts picking up elevation, and gets pretty close to a 45 degree incline. The steps on the floor are for people standing in the tram to hold their grip. The tram has wooden seats and no seat belts. Windows are largely open, and it's recommended that you keep your hands inside. The greenery around is amazing. Don't miss the little streams of water and flowers growing on the side. It's very pretty. The real view though, is from the top, when you see the entire city enveloped in clouds. It's a sight that will stay with me forever. 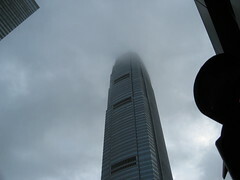 Hong Kong is really close to the equator, and the humidity is really high.The cloud cover should protect you from the sun, but you can lose a lot of water perspiring, so carry a bunch of juices with you. Reaching the peak is just part of the adventure. Once you get up there, you get to the start of the peak trail - a common trail for morning walkers and runners. The trail is 2 kilometres long, with markers every hundred metres. It was about 7:15 when I got there, so I decided to do part of the trail. I walked down for half the distance. On the way you pass a little waterfall and a lot of great views. After getting back down from the peak, I headed out to Hong Kong park. The park houses Hong Kong's walk-through aviary and the teaware museum. The aviary is a large net with trees and a pond inside. A bunch of captive birds are allowed to fly free in there. 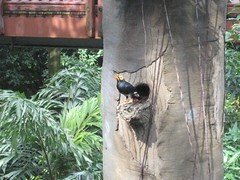 They have several species of birds from South-east Asia including Hong Kong, China, Malaysia, Indonesia and Singapore. I believe some of them are migratory and come from as far away as Siberia. 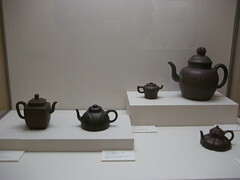 The teaware museum in Hong Kong park walks you through the history of tea making in China. Different utensils and recipes are on show. They have a few videos in addition to all the models. You can also access the Internet from here. Two Windows PCs sitting in the corridor are permanently connected to the net. You can only use Internet Explorer however, so if you need to chat, use a web based messenger, and if you need other services, forget it. The last place on my list was Ocean Park. To get to ocean park, you need to take a bus from in between the Lippo Towers. You can buy bus tickets as well as entrance tickets for Ocean Park at the bus stop. The bus takes you all the way to Ocean Park, and brings you back. Once there you enter and go through on your own. Take note that you can find discount booklets at the airport which offer you discounts to various places, Ocean Park included. Ocean park has several sights to see. 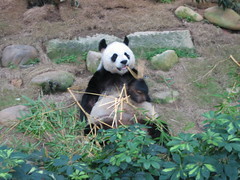 For visitors from most other parts of the world, the Panda Habitat would probably be the biggest attraction. They have two Pandas - a male and a female. They aren't caged in, but are separated from visitors by a moat. The entrance to the panda habitat is accessible for people in wheelchairs and mothers with baby strollers. Try not to use the flash when taking pictures as this could disturb the animals. The same goes for other areas in Ocean Park. Near the Panda Habitat is the Butterfly house and a pool with flamingos. Ocean Park is made in two parts - the upper area and the lower area. 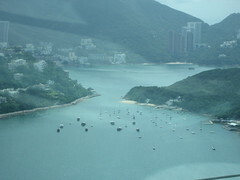 The lower area is connected by road to the rest of Hong Kong. The upper area isn't. The only way to access the upper area is via Cable Car from the lower area. The cable car ride itself is slow and scenic, but if you're afraid of heights, it probably isn't for you. You can get a really good view of the South China sea from there. On the other side, you can go for several shows if you have the time. I didn't, but I did have time to visit the aquarium and the shark enclosure. The aquarium is small, but pretty. 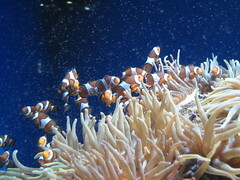 They have a collection of Jellyfish, razor fish, clown fish, sea horses and more. There's a large tank with Sting rays and other fish, and they're really graceful gliding through. The shark enclosure is nothing much to check out, and one can give it a miss. Time was ticking on, and I had to head back to the city. I got on the next bus, but was stuck in traffic as soon as I got back into Hong Kong. It would probably have been better to walk once I'd gotten back, but the bus won't let you off before the end. Now visiting parks in Hong Kong is nice for the morning, but really, that isn't what Hong Kong is about. Shopping and food are the primary attractions in Hong Kong, and if you have the time, seeking out good roadside eateries should be on your list. I didn't have much time, so walked into an office building and looked around for where most people were heading at lunch time. I ended up at a food court with a wide range of local food. One meal really isn't enough to recommend something, so I'll refrain from giving any advice in that area. Walking around the same area brings you to some of the biggest department stores. You can walk from building to building without getting out, wading through a sea of stores. It's a shopper's delight. Prices were a little beyond my budget, and my little back pack wasn't going to carry much. It was also getting pretty close to departure time, and had to head back to the airport. I got onto the next train, and made it to the airport quite close to boarding time. I'd recommend getting back to the airport at least 45 minutes before boarding time which should give you enough time for a shower and a change of clothes before you board. You'll need it. Hong Kong was hot, humid and a treat. I'd love to go back there and spend a little more time. I hear the night life is great and the night view from one of those tall buildings is breathtaking. I've got many more photos up on flickr and some videos on youtube. I've returned to Hong Kong a few times since my first trip, and I never stop liking it. I've also discovered that you can make it between the airport and the city for far less if you use public transport instead of the airport train. You need to take a bus from the airport to Tung Chung and then take the train in. If you're going to stay for more than a day, it's worth it to get an Oyster card. You need to put in a deposit for it, but you get it back along with your balance when you return the card at the end of your stay. From Tung Chung, you can also take the cable car or a bus to head to the buddhist monastery at Ngong Ping. They have a very large bronze statue of the Buddha at the top of the peak. Another destination is the fishing village of Tai'O. There's a bus from Tung Chung to Tai'O. It's a long ride and there's just one or two stops on the way. Most of the village is actually built on the water with boats parked outside or under people's houses. They step out and sail away. It's quite interesting to just walk around the village and note how it's built. Just after dark we were looking around for a restaurant, and saw some people eating in an open area, so we walked in. It turned out to be someone's house and they didn't speak English. Then one of the kids from the house showed up and she spoke a little English and pointed us to the nearest restaurant. At Tai'O you can also go on a little boat ride for HK$20. If you're lucky, you'll see pink dolphins, but even otherwise, the ride is quite nice. It's also a good place to watch the sunset. For food, three things I recommend are the Dim Sum, the Custard Buns and the Cham — a drink of coffee and milk tea. The latter is guaranteed to help you through the worst jetlag. Is it possible to leave the Hong Kong airport even for 7 hours while in transit? If it is, can we leave our luggage at the airport or do we have to take it with us? I have about 7 hours in between flights and am considering whether or not this is feasible to go out and do a bit of touring? Yes, you can leave for 7 hours, but you cannot leave your bags behind unless you check them in. If it's hand baggage, just carry it with you. If it's anything heavier, you may want to look for an airport locker or something. I can't be sure, check with the airline. We will be at HK airport on transit for 7 hours. If I take the airport express, which would be the best station to get off and just walk? What about shopping? Can you recommend the best train station to get off. 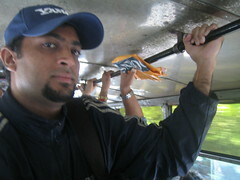 @BSingh: get off at the last station on the train. Get a map at the airport. It will be pretty clear what you should do. Enjoy your stay in Hong Kong no matter it's short or long. Thanks for the tip Wan. Thanks. Yes, there was a lot more to see. 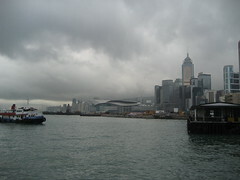 I made a total of three trips to Hong Kong, and saw many things, but I have still not seen everything.